Joget Workflow v6 is an open source platform to easily build enterprise web apps for cloud and mobile. 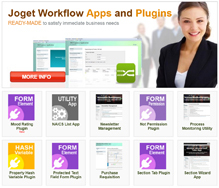 Joget Workflow v6 has a dual pronged focus: User Experience (UX), and App Maintainability and Performance. The App Center, the default landing page providing access to apps and seamless integration with the Joget Marketplace, is now a customizable app! Adapt the App Center to specific needs, or even replace it entirely if required. One of the frequently requested features, a Dashboard Userview element now provides the capability for multiple elements to be presented in dashboard format for better information visibility. The Calendar Userview element displays events in a familiar monthly, weekly or daily calendar view. The focus is on the apps, so the administration and app design interface is designed to be discreet and to stay out of the way. A floating design button toggles to show the Admin Bar and Front-End Edit Mode to show elements directly within the app. Touch devices are now supported! App designers can now use tablets or touch screen PCs to design all the processes, forms, lists and userviews. Dragging, dropping and configuring elements using your fingers or a stylus makes building and maintaining apps more accessible anytime, anywhere. The Spreadsheet element provides Excel-like functionality with formulas and functions, as well as support for file and image uploads. Multi-Paged Forms provide an improved user experience with AJAX support, allowing for switching between pages without the need for full page reloads. The major challenge in app development is not building it the first time, but rather maintaining and evolving it over time. A big focus in v6 is improving app maintainability hence the new Advanced Tools which will make it easier to manage dependencies, while adding support for automatic merging of concurrent changes. For improved accountability, all changes to an app are now captured in the system audit trail as well. The Joget Workflow platform allows for almost limitless extensibility via plugins and custom coding. However, the requirement for coding makes it less accessible to non-coders. In v6, there are now additional configuration options in various elements to allow for simple configuration instead. For example, retrieving data from multiple forms can be accomplished using simple form selections, instead of using custom SQL JOIN queries. Caching is now available for all userview pages. Requiring just a couple of settings, any userview menu and page can be easily cached to eliminate bottlenecks and reduce server-side processing. When used appropriately, caching can greatly improve the performance and scalability of apps. A new feature incorporated into the Performance Analyzer now provides monitoring of database connections at runtime. When logged in as an administrator, the Performance Analyzer displays the number of active and idle platform datasource connections at the top left corner of the app userview. There is also database connection leak detection, which works for both BeanShell scripts and custom plugin code. When a possible leak is detected, a warning will be captured in the logs to allow administrators to identify the page causing the problem. v6 includes additional useful developer and integration plugins to cater for more complex app requirements. More JDBC and BeanShell plugins are now available out of the box to allow for custom SQL and BeanShell code in forms and lists. The Permission Userview Menu element allows userview permissions to be configured in the front-end app. There is also a new Sync LDAP Directory Manager that allows LDAP and Active Directory information to be synchronized with the local user directory. Joget is built on Java using the proven and popular enterprise libraries Spring Framework and Hibernate ORM and in v6 they will be upgraded to new stable releases (Spring 4.3 and Hibernate 4.3) to take advantage of all the performance, stability and security improvements available. The JSON Tool provides more built-in integration options to external systems, with support for POST requests, request headers, payloads, debug mode, etc. Platform-wide default SMTP email settings are now available in the General Settings, allowing a single configuration to be applied across all apps and plugins. User logins can now be secured with built-in support for Multi-Factor Authentication (MFA), working with TOTP standard mobile apps like Google Authenticator or Microsoft Authenticator.